With so many things on the go and interruptions all the time, it can be very difficult to stop and listen what another person has to say. However, if learning to become a better listener is truly important to you, you will make this a priority. Excuses or results – you can’t have both! You will build more meaningful relationships in your personal and professional life, and you will also become a better role model to your children. Think about it, is doing the dishes more important than what you child has to tell you about his/her day at school? Is answering emails in the evening more critical than giving your family a few hours of your undivided attention? Be relaxed and look at the person. Listen with the intent to understand – you will become more likeable. Quit multitasking (smarten up and drop that smart phone) – you can’t truly listen if you’re doing something else at the same time. Be interested instead of interesting – learn from the people around you. Ask open-ended questions – learn to focus on the other person instead of being internally focused. Stop imposing your “solutions” – everyone’s experience is different, just hear people out and allow them to come up with their own solutions (I know that’s a hard one). Avoid making assumptions about what people think and what they will say. Summarize what was said at the end of the conversation. People really like people who can listen because they are so rare. 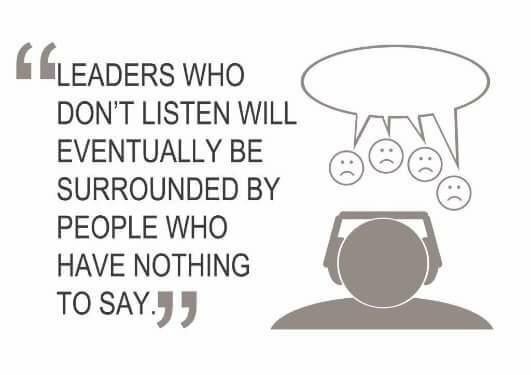 Listening = learning to see new perspectives. What are you waiting for? Start practicing NOW.